Looks like your arm's off there, frater. There's an old saying that goes something like this: blood is more expensive than turnip water, and it's red, too. That's kind of the theme of the new DLC for Total War: Rome II: pay some money, see some blood. If only we had DLC back when Mortal Kombat first hit consoles! 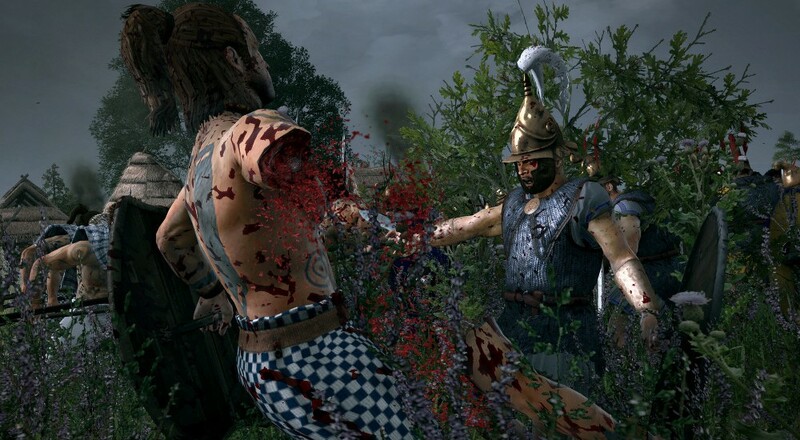 The Total War: Rome II Blood & Gore DLC is all about upping the violence. There are lots of references to things being "visceral" and "gruesome", all thanks to a more refined particle system that coats combatants in gore. Decapitations, dismemberments, impalements and the like are all suddenly commonplace. It's Total War's way of helping you feel like you're really on the front lines in the ancient world. It's also a way to teach children that humans 2,000 years ago were filled with a lot more of the red stuff than we are now. Don't worry, though. There's a graphics option for turning the blood on and off. We're not sure why you'd buy the DLC only to turn it off the signature feature, but you can. Just because you're that much of a badass. Page created in 0.4526 seconds.